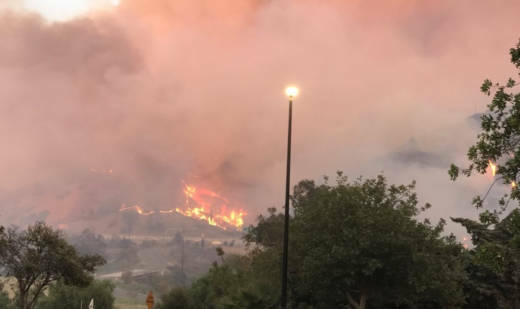 A powerful wildfire is sweeping through the well-populated suburban canyons of Southern California, creeping up to the edges of homes and down to the shoulder of a major freeway. Fast-moving firefighters, however, were able to beat back the blaze burning in Corona, Anaheim and Chino Hills Monday, keeping damage to a minimum as more than 1,000 people evacuated from their homes. The fire had surged to more than 2,000 acres after starting at 1 p.m. Monday. It is still only 5 percent contained, and authorities say more than 900 firefighters are currently assisting, and that the acreage is expected to rise. Firefighters have been working around the clock to protect 500 homes threatened by the flames, but there's concern that erratic Santa Ana winds in the area could fuel another flare-up. "We are worried about when the winds kick up and it warms up today," said Capt. Steve Dohman, spokesman for the Orange County Fire Authority. "So we're bringing in a number of helicopters in addition to firefighters on the ground to make sure we get the hot spots, knock out any potential sparks so we don't have any threat to the homes." Dohman says crews are expected to remain on the scene over the next few days. Meanwhile, the CHP has shut down roads throughout Corona. Mandatory evacuations have been ordered in the Dominguez Ranch area of west Corona, and voluntary evacuations have been issued for the rest of west Corona. The fire also caused an off-ramp closure on the eastbound 91 freeway Tuesday morning. Authorities are monitoring winds that may shift to bring the fire toward Anaheim. Jeff Peterson of Corona arrived at his home of 17 years about two hours after the fire had been burning, and the wind appeared to be blowing it away from his house as he watched it with a neighbor. "We just looked at each other and said, 'It's time to go get the valuables,' " Peterson told the Orange County Register. Wildfires had burned in the canyons around his house, but never one like this, he said. "I never thought that we'd see it," Peterson said. "It was unreal, watching this happen. The flames made so much noise, they sounded like jet engines." Peterson and between 1,000 and 1,300 others from about 300 homes, all in Corona, were under evacuation orders. The damage was relegated to a single warehouse-style building and one big rig that was in flames on State Route 91. That freeway was acting as a fire line blocking the fire's spread. But with some lanes closed, traffic was backed up for several miles. The Tuesday morning commute was likely to be extremely difficult. Firefighting aircraft were grounded after dark, but helicopters continued making drops on the blaze through the night. Intense flames could be seen creeping down hills over subdivisions where ash was raining down. Cora Angeles, 66, prayed and cried as she sat in a parked car after frantically fleeing from the flames that raged toward her home. She was able to leave with only important documents, clothes and her 12-year-old granddaughter. A huge plume of smoke could be seen over much of Orange County, including by the thousands of fans at Angel Stadium in Anaheim, where a large crowd was watching the Angels play the Chicago White Sox.